Following convictions on Monday of seven Indian citizens for the 1984 Union Carbide gas leak disaster, Amnesty International has called on the Indian and US governments to take the next step by bringing the US-based Union Carbide Corporation (UCC) to justice. 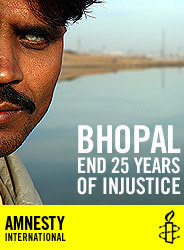 Seven Indian nationals, who formerly worked for the Indian company Union Carbide India Ltd (UCIL), were found guilty by the Bhopal Court of causing death by negligence, a charge that carries a maximum two year sentence. “These are historic convictions, but it is too little, too late. Twenty-five years is an unacceptable length of time for the survivors of the disaster and families of the dead to have waited for a criminal trial to reach a conclusion,” said Audrey Gaughran, Director of Global Issues at Amnesty International.